In his First Letter to the Corinthians Paul cites "administrators" as one of God's gifts to the Christian community (1 Cor 12:28). But many who serve in administrative service today have difficulty seeing how their everyday work is an expression of discipleship. This book, written by an experienced administrator and noted biblical scholar, shows how the various functions of institutional administration are deeply rooted in the Scriptures and are a genuine expression of our call to discipleship. Leadership, mission statements and planning, finances and fund raising, personnel issues, communications, and public relations-all of these seemingly "secular" activities serve to build up the Body of Christ and deserve to be recognized as authentic Christian ministry. To see administrative service as a biblically rooted gift can help those involved in this way of life to find deeper and more satisfying spiritual meaning in what they do. Donald Senior, CP, is professor of New Testament at Catholic Theological Union in Chicago. He served for twenty-three years as president of CTU and is now its chancellor. He is a frequent lecturer and speaker throughout the United States and abroad and serves on a variety of boards and commissions, including the Pontifical Biblical Commission. He has published extensively on biblical topics, with numerous books and articles for both scholarly and popular audiences. "The Gift of Administration is itself a gift to leaders of religious institutions. Donald Senior is as able a New Testament scholar as he is an administrative leader, and he connects administration in the present moment with patterns of churchly leadership described in the New Testament. The result is true wisdom from the long tradition in a field dominated by advice from present experience. The Gift of Administration is simply the best book I have ever read on administrative leadership; it stands high above a crowded field of contenders." "With equal parts erudition and inspiration in his remarkable book, The Gift of Administration, Donald Senior reframes the necessary work of administration as life-giving ministry. Grounded in Scripture and rich theological tradition, this book will surely inform and encourage all who are entrusted with the leadership and management of faith-based organizations." "Donald Senior brings together in this volume a wealth of personal and professional experience: extensive theological study, research, writing, and teaching, along with twenty-three years as president of a graduate school of theology. He provides a cogent scriptural foundation for understanding the work of administration as both a calling and a gift and does so in ways that are inviting, inspiring, and encouraging. Senior's stirring words find genuine and profound meaning in everything from fund-raising to finances. This is a must-read for all who are called to serve as administrators." "A well-written book on the spiritual work of leadership. The author identifies the importance of faithful, thoughtful, and inspired leadership that helps the institution to remember its mission. He does an excellent job utilizing scripture as a guide for leadership." "The author of The Gift of Administration holds the unusual credentials of a renowned biblical scholar and a skilled, admired administrator. The book reflects the gifts of both vocations as Donald Senior fittingly brings to bear the biblical imperatives that require leaders to serve without seeking honors. In a central chapter on the responsibility of building community, he identifies many qualities of a truly spiritual leader, such as one who is courageous, compassionate, humble, truthful, and understanding. Throughout the book, those looking for practical applications will find them in chapters on mission and planning, finances and fund-raising, among many others. " "The time was long overdue for a biblical and theological book about administrative work. 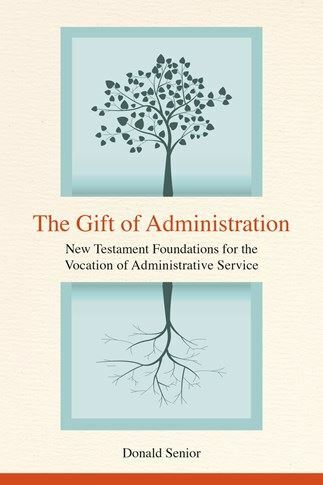 The beauty of The Gift of Administration is that Senior not only draws rich material from Scripture but also provides indispensable frames from different theologians and leaders like Dietrich Bonhoeffer and Pope Francis for approaching the role of administrator. This is a unique and invaluable resource." "For leaders, or anyone weary of annoying daily organizational minutia, Senior's book could be an inspiring relief and a reminder that everyday tasks instill Gospel values and activities everywhere." "Donald Senior's small book is ideal for anyone searching to build a personal theology of administrative leadership. The book creates a quilt of meaning for Christian administrators, employing as its foundation the biblical stories about the church's earliest administrative challenges, successes, and failures." "Father Donald Senior's latest work combines sound exegesis with astute reflections that are the fruit of a long and successful career in higher education administration. In identifying the various activities of the administrator-articulating the mission, leading, planning, fund-raising, communicating-as expressions of discipleship that are founded in the New Testament itself, Father Senior has uncovered a hitherto neglected theological and spiritual depth of administration. And, as we have come to expect from Father Senior, he writes with clarity and precision. This book should be required reading for bishops, pastors, mission leaders, educational administrators, or anyone else who has responded to the call to be a steward of the church's goods." "Fr. Donald Senior has given us a great gift in this easy-to-read overview of ecclesial administration. Guiding or steering a ship-kubernetes in Greek-is the word St. Paul uses in 1 Corinthians 12 to speak of administration. In this book, Fr. Senior provides a firm biblical foundation for the charism of `steering' the barque of Christ-flowing from the call of Jesus who laid out the vision of the servant leader. The Church on mission needs servants good at planning, coordination, and communication. With this book, Fr. Senior contributes to a ministry easily taken for granted." "Senior has performed a great service to those of us who teach church management and who need to convince their students—especially the clergy—that while the church is not a business, it still must be administered, and that administration can in fact be carried out in a spiritual manner while enhancing the administrator's personal spirituality. For those priests who argue, `I wasn't ordained for this,' Senior offers a sharp and convincing rebuttal. Any administrator in a secular setting would benefit from it, too. Its message on the vocation of administrative service is universal."